Mabel R. Winter writes in regard to a possible position at the Berry Schools. She adds that she is interested in the work of the schools and she has previous experience in teaching. 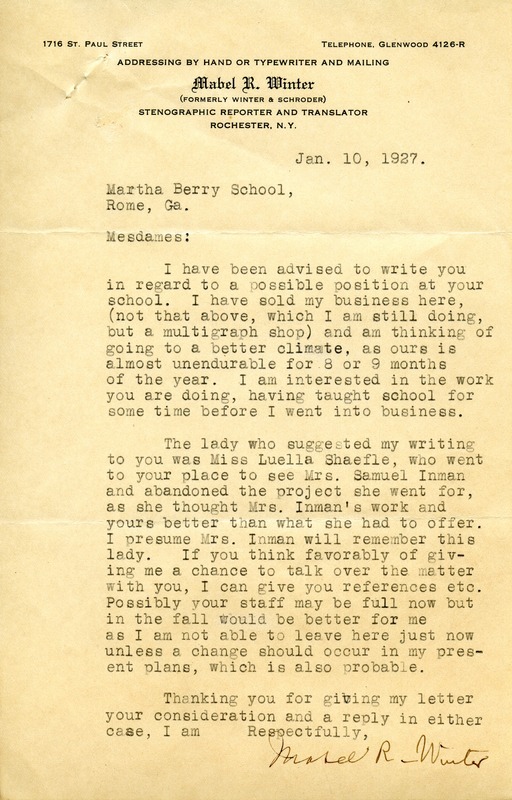 Mabel R. Winter, “Letter to the Berry Schools from Mabel R. Winter.” Martha Berry Digital Archive. Eds. Schlitz, Stephanie A., Christy Snider, Ree Palmer, et al. Mount Berry: Berry College, 2012. accessed April 24, 2019, https://mbda.berry.edu/items/show/6301.